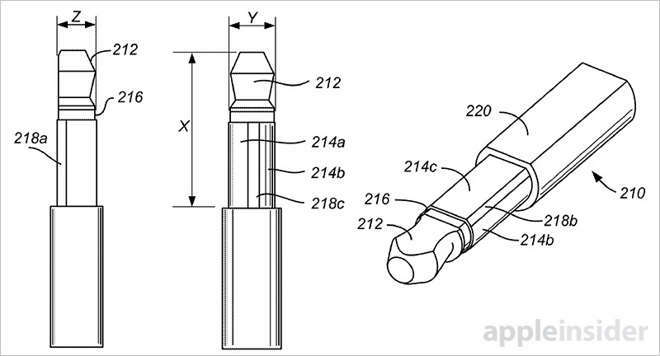 Apple has patented a shrunken-down headphone connector that shaves precious volume off existing 3.5mm and 2.5mm jack standards by reshaping the plug, thereby removing —albeit temporarily —an inevitable limiting factor in its quest for perpetually thin smartphones. The U.S. Patent and Trademark Office on Tuesday issued Apple U.S. Patent No. 9,142,925 for a "D-shaped connector" that replaces the existing low-profile headphone plug and receptacle standard with a shorter, thinner design. This "improved" model would sport all the functionality of a modern 3.5mm TRRS (tip, ring, ring, sleeve) connector, but with a trim profile suitable for use in extremely thin devices. Much like today's headphone plug, Apple's design features external contacts positioned along a sleeve. Dielectric strips isolate contacts along the sleeve carrying left audio, right audio and microphone signals, while a ground contact lives in the plug's tip. Deviating from current standards, however, is its shape. Taking on a "D" profile, Apple's plug has one flat side that acts as a keyed feature, meaning it restricts insertion to a matching D-shaped cavity. Some embodiments incorporate a flexible inner member that helps mitigate potential insertion issues, while at the same time reinforcing structural integrity. Certain embodiments specify a diameter of 2.0mm from the plug's flat portion to its opposite edge, considerably thinner than current products. For a fairly sensitive electronic part, the headphone connector is constantly exposed to mechanical strain. A flexible elastomer or similar material could help cut down on breakage from repeated insertion and extraction operations. 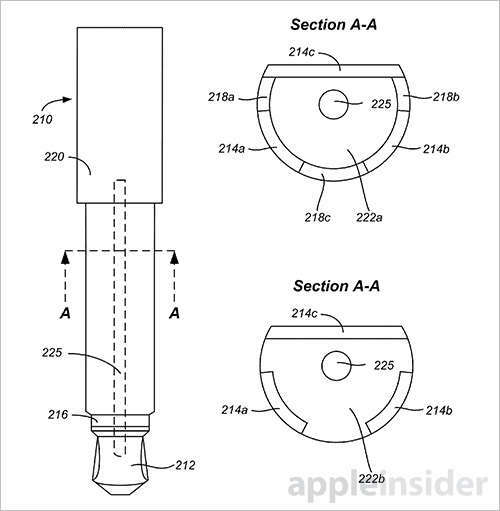 On the device side, Apple describes a D-shaped receptacle protecting an internal mechanism designed to capture the plug, much like regular jacks. The system can be mechanical or magnetic, while some embodiments allow for a spring-loaded ground contact that doubles as a retention feature. To Apple CDO Jony Ive's dismay, iPhones and iPads can only be as thin as their largest internal component, as evidenced by the "camera bump" on iPhone 6 and 6s. However, unlike the longstanding headphone jack format, camera technology benefits from component miniaturization trends, meaning future iSight modules will likely see size reductions in line with other iPhone innards. As an industry standard, the 3.5mm plug format is ancient compared to its high-tech iPhone component stablemates, and customers have shelled out hundreds or thousands of dollars on compatible hardware. Apple could bypass TRRS designs altogether and introduce a Lightning-connected headphone, but that would prohibit simultaneous charging. It remains to be seen what Apple has planned, but if its portable device designs get much thinner, the demise of the 3.5mm plug is a near certainty. 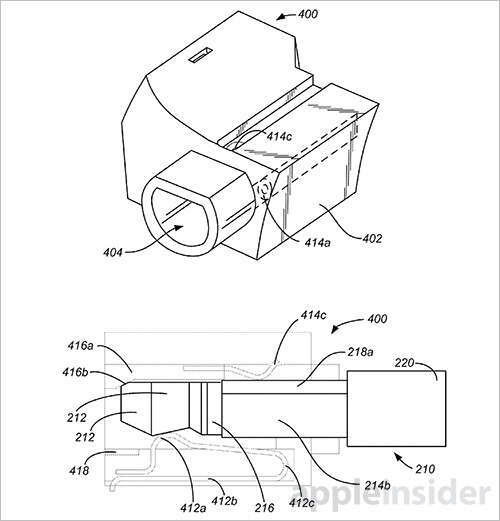 Apple's D-shaped connector patent was first filed for in May 2011 and credits Albert J. Golko and Mathias W. Schmidt as its inventors.